This is an updated version of an article I wrote in 2003 on Canada's stamps and currency related to space exploration. In addition to my interest in space exploration, I also collect stamps. So it is no surprise that my collection includes stamps about space exploration. And Canadian stamps on this topic are of course of special interest. As a semi-official form of recognition, postage stamps also reflect the interests of the government and society in general. In this case, Canadian stamps reflect the moderate degree of interest Canadians have in their own space program. This moderate level of interest is shown in how Canada marked its early space achievements. 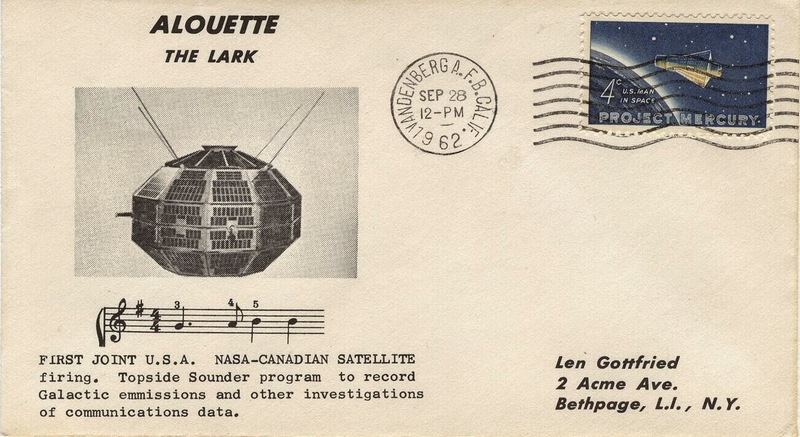 When Canada launched its first satellite into orbit in 1962, the there was no stamp issued to mark the event. Instead, the first stamp related to Canada's space program honoured Canada's second satellite. A five-cent commemorative stamp featuring Alouette II was issued on January 5, 1966, a few weeks after the satellite's launch. Yet no Canadian stamp was ever issued for Alouette I. In the absence of another explanation for ignoring this "first," it appears that politics was involved. Back in the 1960s, Canada had a conservative stamp issuing policy, and the post office was a government department headed by a politician who sat in cabinet. In 1962, when the first Alouette was launched, John Diefenbaker's Progressive Conservative government was on its last legs and was replaced a few months later by a new Liberal government under Lester Pearson. The Conservatives never took the opportunity to honour the first Alouette with a stamp, and the Liberals waited to put out a stamp until a satellite had been launched on their own watch. Both Alouettes conducted research on Earth's ionosphere, a layer of the atmosphere that reflects radio waves. In the days before communications satellites, the ionosphere and its changes had major impacts on long-range communications. 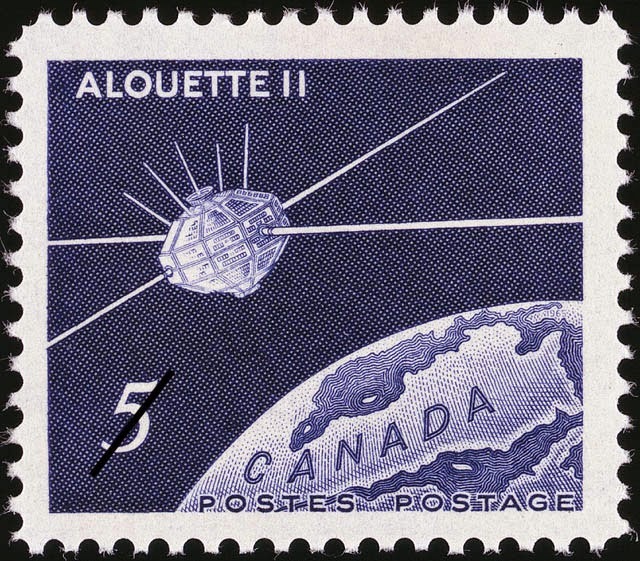 Prior to the Alouette stamp, only four Canadian stamps contained any reference to outer space. A 1953 wildlife set included a polar bear on a two-cent stamp with a background suggestive of the Aurora Borealis, and a 15-cent definitive issued in 1954, showed a Gannet flying in front of the Big Dipper and Polaris, the North Star. Canada's two 1964 Christmas stamps depicted the Star of Bethlehem. Three other stamps from this period also relate to space. Canada joined the U.S. and other countries in issuing a special stamp for the International Geophysical Year of 1957-1958, an event closely tied to the birth of the space age. Canada's stamp shows a microscope and a globe. Another 1957 commemorative shows explorer David Thompson using a sextant. And on February 23, 1959, a five-cent commemorative honoured 50 years of flight in Canada with a design showing the Silver Dart, the first aircraft to fly in Canada, and three jet aircraft that bear a striking resemblance to the CF-105 Avro Arrow. This stamp design is rich with irony because the Arrow had been cancelled just three days before the stamp came out. Only five of the Arrows ever flew, and 32 engineers who lost their jobs when the Arrow was cancelled moved south and found work with the U.S. National Aeronautics and Space Administration, where they played important roles in the Mercury, Gemini, Apollo and Space Shuttle programs. After the Alouette stamp, Canadian space stamps were few and far between for nearly two decades. An Olympic ceremonies set issued at the time of the 1976 Montreal Summer Olympics shows a communications satellite on the eight-cent value between two Olympic torchbearers. A communications satellite appeared 10 years later in the Expo 86 set marking the World's Fair in Vancouver. In 1985, Canada honoured the flight of its first astronaut, Marc Garneau, with a 32-cent Canadians in space stamp. 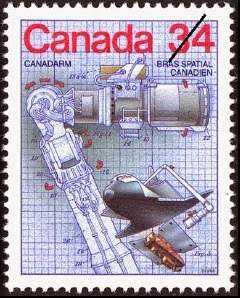 In 1986, a set of Canadian technical achievement stamps included one featuring the Canadarm or shuttle Remote Manipulator System that has been an integral part of the space shuttle. Another stamp in the set depicts the g-suit, which is widely used by pilots and astronauts to protect against blackout. Canada issued two 42-cent space achievement stamps that are probably its best known space stamps. One stamp showed the Anik E2 communications satellite, and another stamp bore a hologram showing the Space Shuttle above Canada. The hologram stamp, Canada's first, is popular with collectors because of its many varieties. Later in the decade, a technology set issued in 1996 included an aerospace technology stamp, but the design emphasized the "aero" part of the term. The design of the 1995 stamp commemorating the 125th birthday of the Province of Manitoba includes a Black Brant sounding rocket that is produced in Winnipeg by Bristol Aerospace. Five of the 68 stamps in Canada Post's Millennium Collection set in 2000 touch on space themes. The Canadian space program stamp depicts the Alouette, ISIS, Hermes, Anik and RADARSAT satellites, along with the Canadian remote manipulator system installed on the International Space Station. The Space Shuttle appears on a stamp featuring the Imax film technology developed in Canada, and a communications satellite is shown on a stamp featuring Canada's largest telecommunications company, Bell Canada Enterprises. Canadian inventor George Klein, whose inventions include the STEM (storable tubular extendible member) antenna used on Canadian and American spacecraft, appeared on his own stamp. And Abraham Gesner, the inventor of kerosene, also has a stamp in this set. The invention of kerosene, which was used in the Saturn V and many other rockets, was also honoured with a Canadian 37-cent stamp in 1988. Later in 2000, Canada Post issued a set of four Stampin' the Future stamps, which included two with a space theme. The stamps were designed by children and are similar to an American set issued at the same time to coincide with the World Stamp Expo 2000. In 2002, a set of stamps featuring tourist destinations included a $1.25 stamp showing the Aurora Borealis, which draws tourists to Canada's north. A 48-cent stamp honouring St. Mary's University in Nova Scotia shows a student at a telescope. Canada Post put out its largest issue of space stamps ever on October 1, 2003, when it honoured the eight Canadian astronauts who have flown in space with a sheet of eight self-adhesive stamps that include holographic stamping and micro-embossing. The 48-cent stamps represent missions flown on NASA space shuttles by Canadian astronauts Marc Garneau, Roberta Bondar, Steve MacLean, Chris Hadfield, Robert Thirsk, Bjarni Tryggvason, Dave Williams and Julie Payette. The bottom of the sheet depicts one of the high points of Canada's space program, the "handshake" between the Canadian-built robot arm on the shuttle Endeavour and the Canadarm2 aboard the International Space Station. Like the hockey all-star sets around that time, the astronaut set broke Canada's traditional prohibition on stamps for living persons outside of the Royal family. That rule was been officially lifted after that time, and since then many other living Canadians have appeared on our stamps. Canada's role in creating a satellite-borne system to assist in search and rescue operations was acknowledged in a set of four search-and-rescue stamps issued on June 13, 2005. The four stamps depict search-and-rescue operations, along with a Russian Nadezdha or COSPAS satellite, and an American NOAA Polar Orbiting Environmental Satellite. Both satellites also appear on the margins of the issue's miniature sheet. In 1979, the U.S., the Soviet Union, Canada and France set up the COSPAS-SARSAT satellite rescue system in a rare example of Cold War cooperation. Canadian-built search-and-rescue receivers were put on U.S., Russian and French satellites, and the system began operation in 1982. On June 30, 2006, Canada Post marked the 100th anniversary of the Atlas of Canada with a 51-cent stamp. The stamp has no space theme, but the margin of the stamp's pane shows a satellite orbiting the Earth to obtain data from Earth orbit for today's Atlas of Canada. The "satellite" closely resembles the Pioneer 10 and 11 spacecraft, which were launched in the 1970s and explored Jupiter, Saturn and the outer Solar System. Although Canada has a strong tradition of excellence in astronomy, it was only in 2009 that Canada issued its first stamps dedicated to the science. On April 2, Canada Post put on sale two 54-cent stamps and a souvenir sheet in honour of the International Year of Astronomy. The year was celebrated to mark 400 years since telescopes were first pointed at the skies. One stamp shows the Horsehead Nebula in Orion and the Dominion Astrophysical Observatory near Victoria, B.C., which was the world's largest telescope for a few months after it was completed in 1918. The other stamp shows the Eagle Nebula in Serpens and the Canada-France-Hawaii Telescope on the summit of Mauna Kea on the island of Hawaii, which began operations in 1979. The margin of the souvenir sheet and a booklet containing the stamps also contain photos of other astronomical objects. In recent years, Canada Post has issued definitive stamps featuring Canada’s maple leaf flag. A set of five “permanent” domestic rate stamps issued in January 2011 included a design showing the Canada wordmark, which incorporates the flag, on the Canadarm in space. The five stamps were issued in booklets of ten self-adhesive stamps and in souvenir sheet form. In 2011, 2012 and 2013, Canada Post issued stamps featuring the twelve signs of the zodiac. The four constellations depicted each year included traditional drawings of the constellation sign overlaying a star map of the constellation. The dozen stamps, all with a "permanent" domestic rate value, were issued in booklet and souvenir sheet forms. 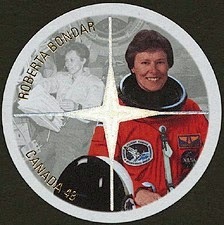 Canadian space achievements have also made their way onto stamps from other countries. In 1968, Barbados issued a set honouring World Meteorological Day that included a stamp depicting a large cannon built by a Canadian team headed by Dr. Gerald Bull. The High Altitude Research Program (HARP) launched projectiles into high trajectories, but funds were cut off before Bull could attempt a satellite launch using the cannon. While some research was conducted at a site on the U.S.-Canada border in Vermont and Quebec, a cannon was built in Barbados with help from the U.S. military. In 1987, the Soviet Union marked the success of the COSPAS-SARSAT search-and-rescue program with a souvenir sheet. From the U.S., the 1981 space achievements set of 1981, and the $3.00 Challenger stamp of 1995 show the Canadarm on the shuttle, and the Canadarm appears on shuttle stamps from other countries, notably Germany's 1975 shuttle definitive. Alouette was featured in a 1966 Polish space set and a 2012 souvenir sheet from Mozambique. Marc Garneau, Canada's first astronaut, appeared on the Gambia's sheet of stamps in 1994 marking the 25th anniversary of Apollo 11. Because all Canadian satellites and astronauts have been launched outside Canada, commemorative envelopes or covers marking these launches are available with cancellations from these foreign launch sites. An Alouette I launch cover from its Vandenberg Air Force Base launch site in California is illustrated. Commemorative "tracking" covers from Canadian locations exist for early U.S. human space flights, especially Apollo flights. These covers are of limited value because no U.S. human spacecraft flew over Canadian territory until the Skylab program in 1973. More information on space stamps is available from the website of the Space Topic Study Unit in the U.S. and the Astro Space Stamp Society in the U.K. The best online source of information on Canadian stamps is the Canadian Postal Archives. A Canadian spacecraft made its first appearance on our paper currency on a $100 bill that the Bank of Canada circulated from 2004 to 2011. The back of the bill showed RADARSAT-1 flying over a map of Canada. In 2013, Canada's new $5 bill was put in circulation, complete with a depiction of a spacewalking Canadian astronaut near Canada's contribution to the ISS - the Dextre remote manipulator hand and Canadarm2. The design was unveiled by Canadian astronaut Chris Hadfield during his stint in 2013 as commander of the ISS. Four Canadian coins also relate to space. A $20 coin issued in 1996 as part of a series marking the history of Canadian aviation depicts the Avro Arrow and Jim Chamberlin, who helped design the Arrow and went on to design the Gemini spacecraft for NASA. In 2006, the Royal Canadian Mint honoured astronaut Chris Hadfield's installation of Canadarm2 on board the International Space Station with two coins, one a $300 gold coin and the second a $30 silver coin. For the International Year of Astronomy in 2009, the mint issued a $30 silver coin. "Canada's Space Story On Its Stamps," The Astrophile, November-December 2003, 251-254. "Canada's 40-Year Spaceflight Heritage," The Astrophile, May-June 2003, 118-123. This entry records my impressions from my visit in November 1980 to the Jet Propulsion Laboratory in Pasadena, California, for Voyager 1's encounter with Saturn. It is adapted from an article I wrote for Spaceflight magazine in August, 2004, on the occasion of the Cassini spacecraft's arrival in orbit around the ringed planet. In the ten years since, Cassini and the Huygens spacecraft it dispatched to the surface of Titan in 2005 have further revolutionized our views of the Saturnian system. Cassini's arrival at Saturn marked the first visit by a spacecraft to the ringed planet in nearly 23 years. Only three spacecraft had gone there before, all of those visits taking place in a narrow two-year time span – Pioneer 11 on September 1, 1979, Voyager 1 on November 12, 1980, and Voyager 2 on August 26, 1981. Pioneer 11’s mission was mainly as a pathfinder, proving that spacecraft could survive the rigors of passages through the asteroid belt, the Jovian and Saturnian magnetic fields, and Saturn’s ring plane. Its primitive imager gave scientists and the public only a taste of the views Jupiter and Saturn offered. Both Voyagers had passed by Jupiter in 1979, providing stunning views of the planet and its moons, most memorably the active volcanoes on Io. As Voyager 1 approached Saturn in the fall of 1980, more than the usual amount of anticipation was in the air at the Jet Propulsion Laboratory in Pasadena, California. Much of the future of planetary exploration hinged on the success of this encounter, because Voyager 1 had the dual mission of passing close to both Saturn and its moon Titan, the only moon in the solar system known in 1980 to have an atmosphere. Titan's importance was shown by the fact that Voyager 1's path by Titan would direct it away from the orbital plane of the other planets. Only if Voyager 1 succeeded in getting data from Titan on its way in toward Saturn would Voyager 2 be freed to take a path by Saturn that would direct it to Uranus and hopefully Neptune. A failure of Voyager 1’s Titan encounter would mean that Voyager 2 would be directed to pass close to Titan, and that path would exclude further Voyager planetary encounters. We know today that both Voyagers succeeded – Voyager 1 obtained its crucial data from Titan and Voyager 2 visited in its turn Saturn, Uranus and Neptune. Voyager 1’s encounter with Titan wound up raising more questions than it answered, and those questions inspired the European Space Agency to send the Huygens probe to Titan's surface in 2005 after riding aboard Cassini to the Saturnian system. When it came to coining superlatives to describe the encounter, I had plenty of competition. In addition to the scientists and engineers at JPL, there was a crowd of nearly 1,100 reporters and science fiction fans, including a number of celebrities, whose activities were chronicled by a reporter from People magazine. Carl Sagan, then at the height of his fame as the star of television's Cosmos, rubbed shoulders with the media horde to shoot segments for a news programme on an American TV network. Many past leaders of the space program, including former JPL director William Pickering, joined the crowd. A large British media delegation was headed by Patrick Moore. California Governor Jerry Brown spent several hours at JPL on encounter day, accompanied by his science advisor, former Apollo astronaut Rusty Schweickart. Brown repeated his contention, which even then sounded tired, that "resource efficiency and technological innovation are the keys to the future." Clyde Tombaugh, who 50 years earlier had discovered Pluto. He autographed copies of his new book on a recent spate of discoveries about the planet he had discovered as a young man. Most of the information was given out in daily morning press briefings, which drew standing room only crowds to JPL's von Kármán Auditorium. After scientists presented the latest photos and other data, journalists vied with one another for the first and best questions. 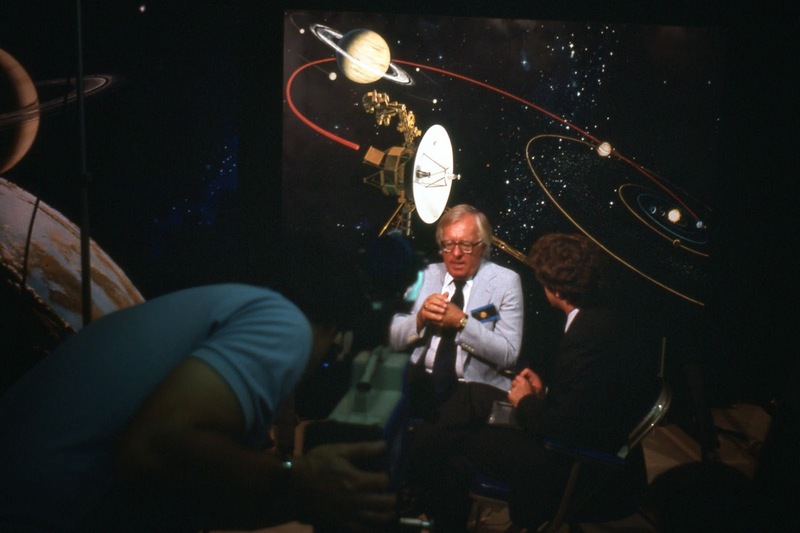 A large model of Voyager dominated one wall of the auditorium, and formed the backdrop for television news reporters and interviews. The crowds grew and contracted in direct relation to the proximity of the Nov. 12 encounter. There was activity in the press area almost around the clock that week as Voyager 1 sent home a seemingly ceaseless stream of photographs that flashed in their raw forms onto television screens at the Voyager control centre at JPL. Following the daily press briefings, reporters lined up to pick up their own copies of the best images. The photo office just outside the auditorium was adorned with a cartoon showing a hand clutching a photo of Saturn sticking out of an ocean surface, circled by shark fins. Most reporters still used typewriters and telephones to file their stories, since the internet, word processors, portable computers and even fax machines were still in the future. Even before most reporters arrived for the encounter, Voyager 1 had sent back dramatic photos showing the structure of Saturn’s rings, including ringlets and hundreds of divisions that showed the rings to be similar to a phonograph record. Late in encounter week, scientists had found between 800 and 1,000 ringlets circling Saturn within the six major ring systems extending 480.000 kilometres from Saturn. As Voyager flew by, the rings had more stunning surprises. The Cassini Division and the Encke Division were found not to be gaps in the rings at all, but ring systems that do not reflect as much light as brighter rings. Intertwined "braids" and “knots” in the outermost ring appeared to defy the laws of orbital dynamics. “Spokes" were found in Saturn's major ring, apparently caused by interaction between the rings and Saturn's magnetic fields. Talk of shepherd moons filled the air at JPL. “In this strange world of Saturn’s rings, the bizarre becomes commonplace,” said Dr. Bradford Smith, the head of Voyager’s imaging team. Saturn's atmosphere defied predictions that it would be topped by haze, and instead revealed Jupiter-like bands, storms and spots. 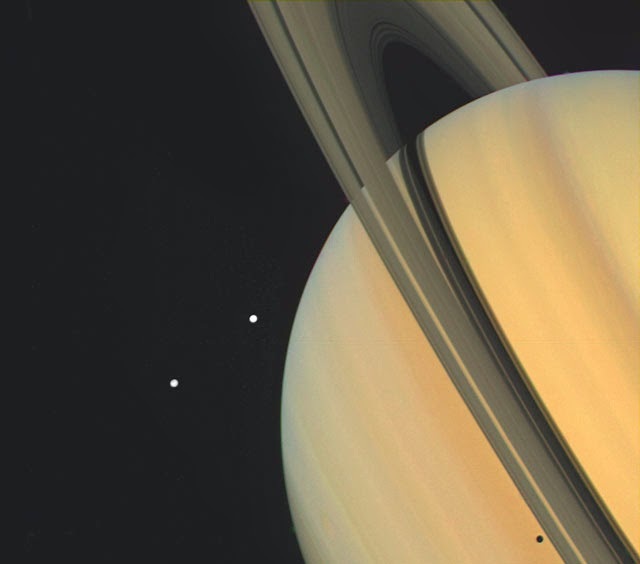 Saturnian moons Mimas, Enceladus, Tethys. Dione. Rhea, Hyperion and Iapetus, were found to be made up mainly of ice, and all with the exception of Enceladus, which was not well placed for Voyager 1’s cameras, were seen to be peppered with craters. Mimas, the closest large moon to Saturn, was photographed with a crater 130 km across, one quarter the diameter of Mimas. A photo of the crater and its central peak drew gasps at a press conference and a comment from Dr. Smith: “This is not an optical illusion.” Soon photocopies of the Mimas photo, complete with additional lines to make the moon look like a dead ringer for the Death Star from Star Wars, circulated around JPL and elsewhere. The photos of Titan, on the other hand, were a disappointment. Titan's orangeish atmosphere obscured the surface. But Voyager’s instruments found Titan’s atmosphere to be deeper and denser than expected. Expectations of a methane atmosphere were dashed when Voyager’s instruments showed that Titan's atmosphere is made up mainly of nitrogen, the element that makes up 78 per cent of Earth's atmosphere. Methane makes up a few percent of Titan's atmosphere and dominates the haze atop Titan's clouds. Titan, which long had been thought to be the largest moon in the Solar System, lost its title due to Voyager’s measurements to the Jovian moon Ganymede, although the matter remained in some question pending information on Neptune’s moon Triton. The amazing photos and data from Saturn and Titan opened the door for Voyager 2 to fly on to Uranus and Neptune. And the following August when Voyager 2 arrived at Saturn, the crowds of press and celebrities at JPL were even larger than for Voyager 1. The U.S. space program was ending a decade that began with the heights of Apollo on the Moon and Mariner at Mars, followed by years of cuts that grounded both NASA’s human and planetary programs. President Jimmy Carter had shown little interest in space exploration during his term of office. And eight days before Voyager 1’s arrival at Saturn, Carter had been defeated in the 1980 presidential election by Ronald Reagan, who ran on a platform of major reductions to government spending. As a result, concerned NASA officials were present in force in the von Kármán Auditorium to court reporters in hopes of tapping public support. Angelo Guastaferro, NASA's director of planetary programs, surprised many reporters when he asked them for suggestions on how NASA could improve its image and get support for more missions to the planets. And a press conference marking the culmination of the Voyager program became a discussion of the causes of the looming hiatus in planetary exploration. Andrew Stofan, another NASA official, blamed over-optimism in the development of the space shuttle, which was then still five months away from its first flight. While the vast amounts of money needed to develop the shuttle in the 1970s starved other programs, Stofan added that NASA had ordered only enough large launch vehicles to support programs until the shuttle was due to begin flying in 1979. Guastaferro said one casualty of the Shuttle delays was the Galileo spacecraft, which had been scheduled for a shuttle launch in 1982 toward a mission in orbit around Jupiter. The NASA officials also discussed how shuttle problems were delaying the Solar Polar mission, a two-spacecraft international effort, and how political problems were besetting the Venus Orbiting Imaging Radar (VOIR) spacecraft. "What scientists want to do in the later part of this century will be more difficult to describe and defend" than the Voyager missions or the 1976 Viking landings on Mars, said NASA’s John Naugle. Those future missions included a Saturn orbiter, a Titan orbiting imaging flight, and encounters with comets. NASA was talking with European nations about sending a mission to Halley's comet in anticipation of its close approach to the Sun and Earth in 1986. As we know now, NASA’s planetary exploration program was put on the back burner for most of the 1980s, with the exception of Voyager 2, which encountered Uranus in 1986 and flew by Neptune and its moon Triton in 1989. Voyager 2 found Triton to be smaller than Jupiter’s four large moons and Titan, although Triton was found to possess a thin atmosphere. NASA did not launch any new planetary missions until 1989, when the shuttle returned to service following the Challenger disaster in 1986. Galileo was launched that year and it didn’t begin its mission at Jupiter until 1995. The Solar Polar Mission was reduced to the European Ulysses spacecraft, which was launched from the shuttle in 1990. VOIR was replaced by the less ambitious but very successful Magellan spacecraft, launched by the shuttle in 1989. A European spacecraft is exploring Venus from orbit today, and an American spacecraft is orbiting Mercury. NASA never did launch a craft to Halley’s comet, but European, Soviet and Japanese spacecraft probed the comet, followed by NASA spacecraft that have since visited other comets. This week the European Rosetta spacecraft went into orbit around a comet. After a two-decade hiatus interrupted only by the failed Mars Observer spacecraft, NASA returned to Mars in 1997. Among the many spacecraft that have gone to Mars since then, two rovers are today roaming the surface of the red planet. And now Cassini is entering its second decade of exploring the Saturnian system. Together with Huygens, Cassini picked up on the exploration of Titan where Voyager 1 left off in 1980. In less than a year, the New Horizons spacecraft will give humanity its first close-up view of Pluto.